Yesterday and today saw some small protests in Iran. They are probably the first stage of a large “regime change” operation run by the U.S. and Israel with the help of Iranian terrorist group. On Thursday and today, the slogans of some protesters turned the call for economic relief into a call for regime change. Reports of signals of international satellite TV networks jammed in large cities of Iran. Would be a sign of regime fear of today’s protests spreading. A search in various languages finds exactly zero such “reports”. Carl Bildt is a former Swedish prime minister. He was recruited in 1973 as a CIA informant and has since grown into a full-blown U.S. asset. He was involved in the Ukraine coup and tried to personally profit from it. The only response to Bildt’s tweet was from one Riyad Swed‏ – @SwedRiyad who posted several videos of protests with one of them showing burning police cars. Just yesterday one lecture at the CCC “hacker” Congress was about the British GHCQ Secret Service and its sock-puppet accounts on Twitter and Facebook. These are used for acquiring human intelligence and for running “regime change” operations. Page 14-18 of the slides (11:20 min) cite from obtained GCHQ papers which lists Iran as one of the targets. The speaker specifically notes a GCHQ account “@2009Iranfree” which was used in generating the protests in Iran after the reelection of then President Ahmedinejad. Mrs Maryam Rajavi, President-elect of the Iranian Resistance, saluted the heroic people of Kermanshah and other cities who rose up today chanting “death or freedom”, “death to Rouhani”, “death to the dictator”, and “political prisoners must be freed”, and protested against high prices, poverty and corruption. The White House and the Netanyahu regime agreed on a strategy towards Iran. Major members of the Trump administration are in favor of “regime change” by “pro-democracy forces” in Iran. A few weeks after an agreement was found, coordinated economic protests start in Iran which are soon hijacked by small groups of very active regime changers. A group of Iranian exile terrorists, well known for deadly collaboration with Israeli spies as well as for having operation cells in Iran, is highly engaged in the protest from very early on. If this the “regime change” operation I presume, the protests will soon get bigger. When the people need money a few thousand dollars are enough to create a large crowd. Small groups will riot while hiding within the larger protests of maybe genuinely concerned people. The “western” media will engage with their usual pseudo-liberal humanism and concern trolling. 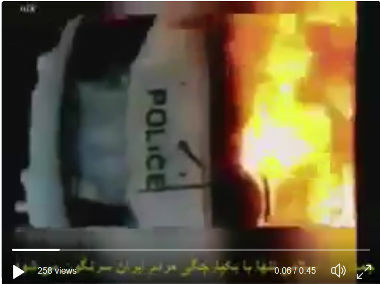 When the police in Iran tries to arrest those rioters who are raising havoc the media will scream “brutality”. Some “martyr” will be created and iconified. Rumors of censorship and suppression will be raised (see Carl Bildt above), fake news will come from everywhere and hundreds of sock puppet Twitter and Facebook accounts will suddenly be “Iranian” and breathlessly report “from the scene” of their Langley offices. For the Iranian politicians and police, the issue is tricky. Economic protests are clearly justified with even Khamenei voicing support for the issue. But rioting in the streets must be suppressed before it further escalates and becomes uncontrollable. Weapons on the protesters’ site firing in all directions may soon become a problem. The Mossad and the MEK are not shy of killing random people. But the Islamic Republic of Iran has genuine support in large parts of the society. There are big civil organizations that support the government – not on every issue but in its general framework. Most Iranian’s are proud nationalists and will be difficult to divide. If this is indeed the “regime change” attempt I suspect, I predict that it will fail.